Living in perpetual sunshine can damage your skin, fade your cloths and make it a wee bit warmer than you’d like to be some days, but it also brings some interesting opportunities. 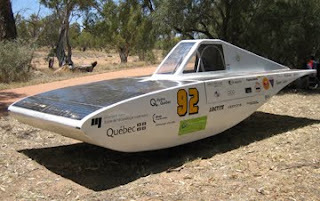 For example, being the half way point in the World Solar Challenge car race. It’s a long way from NASCAR, but it still fun to see. Thirty-two solar powered cars representing 17 countries participated. I saw several of the cars, but was never at the right place with the camera is catch a shot of one going down the road. This team was stopped for lunch along the river. Hope you had a good Thanksgiving!! !